It goes without saying that I’m thankful for My Lady Saraswati’s presence in my life. This year though, I’m also thankful for the renewed attentions of Lady Lakshmi. I’m especially thankful for the new People in my life: Amitabha Buddha, Medicine King Buddha, and Marici Devi. I’m thankful for all of Them, because if They weren’t here, I wouldn’t be able to thank you, my readers, for sticking with me. 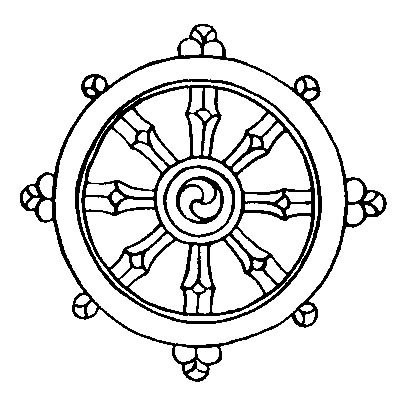 It’s the fifteenth of the lunar month, which in the Gelug tradition of Tibetan Buddhism is held to be an auspicious time to petition the Buddha Amitabha (also known as Amitayus). As Amitabha or “Infinite Light”, he is portrayed as red in color and dressed in the patchwork robes of a monk. As Amitayus, or “Infinite Life”, he is luminous white and adorned as a celestial deity. Amitabha/Amitayus appears in nearly three hundred sutras in the Chinese Buddhist canon alone, and his practices are popular throughout Asia. He is recommended not only as a long-life deity, but as a guardian to those in need. With the warmth of My Lady’s smile. To match her beauty in repose. Nothing shall ever take her place. Mr. Montoya has aided me previously in explaining why the popular (mis)conception of karma as being poetic/cosmic justice is a deeply inappropriate distortion of the original concept. Well, today he will be helping me again. A poster on a Buddhist forum I frequent (and, full disclosure, where I am now a moderator), recently asked why it’s seen as improper to view karma as retribution or punishment. The answer came almost immediately: who is doing the punishing? Karma is not a sentient being. It has no mind, no cognitive faculty, no thoughts. It is a force of nature, like a storm. And just as the same storm that breaks a drought and revives crops can flood rivers and drive people from their homes, karma causes both joy and suffering. For reference, here is part one of this case study. She came home with me that very day. I didn’t know who she was, but she was so familiar, and this was all the more baffling because at this time I didn’t know what I believed in, but it sure as hells wasn’t in living dolls or egregores. Eventually, she told me who she was: Joren. From then on, the characters in my stories took physical form, for good or ill. I’d say it’s been a good thing, really. It’s made their voices that much clearer to me. As for Joren, she chose a new shell the next year, one that suited her much better. It was My Lady Saraswati who drew me to Buddhism, and that’s when the problems started. I resisted Buddhism, then resented Saraswati, and finally regretted my vows to both. Yet I couldn’t give up on either, and have repeated a tired back and forth between the two for months. After all of it, I was left with a broken heart and an empty head. My Lady withdrew and took the Dharma with her, and I cried out for both of them to return. 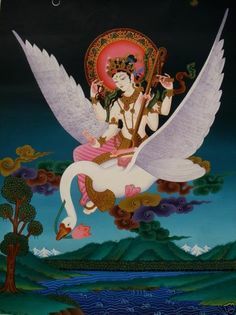 When she did, I realized that Lady Saraswati is my Dharma, and that to be Buddhist I must honor her as I would honor the Buddha. One has only to look at the lore itself. It pretty much doesn’t matter which lore: Celtic, Greek, Norse…it’s everywhere. The gods abuse each other and abuse humans. After all, they are sentient beings, just as we are. They suffer, make mistakes, do good and evil. Do you want to call me impious? Fine. I’ll wear that label proudly. It would be a great disservice to the gods to treat them as if they were something they’re not.